The Trekker Portable Diesel Space Heater delivers the ultimate in clean, efficient heat and requires no electricity. It is easy to start and operate and will deliver clean radiant heat for pennies per hour. This heater operates on readily available diesel fuel and will run up to a full eight hours on 2 liters of fuel. These Pioneer diesel space heaters are ruggedly built for both portability and reliability. They have been designed for safe operation indoors in both permanent and temporary tent or portable structure applications. The Trekker is the ultimate in ice fishing shelters, or wall tent portable diesel heaters. 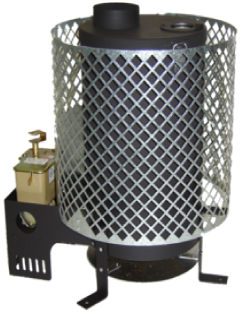 The heater uses a vaporizing burner and is controlled by a fully adjustable fuel regulator. The heat output can be adjusted from 4,000 BTU/h to 12,000 BTU/h (0.4 Liter per hour) (0.12 US gal/h) fuel consumption on high. The heater incorporates two pot holders for cooking purposes. The Trekker also uses multiple operational safety features such as a patented, non flooding burner, fuel regulator overheat protection, fuel shutoff valve, stability legs, and safety pan. A heat shield is attached to the heater to protect the user from accidental contact. IN STOCK for immediate shipping! The Trekker w/fuel and vent kits package can be shipped by Canada Post to Europe, United States and all over Canada. These non-powered diesel space heaters are being used in mining camps, construction sites, agricultural buildings, ice fishing huts, homes and cabins, workshops and garages,emergency shelters, winter camping anywhere you need portable safe heat. The Trekker w/fuel and vent kits package can be shipped by Canada Post to the United States and all over Canada, as well as overseas.